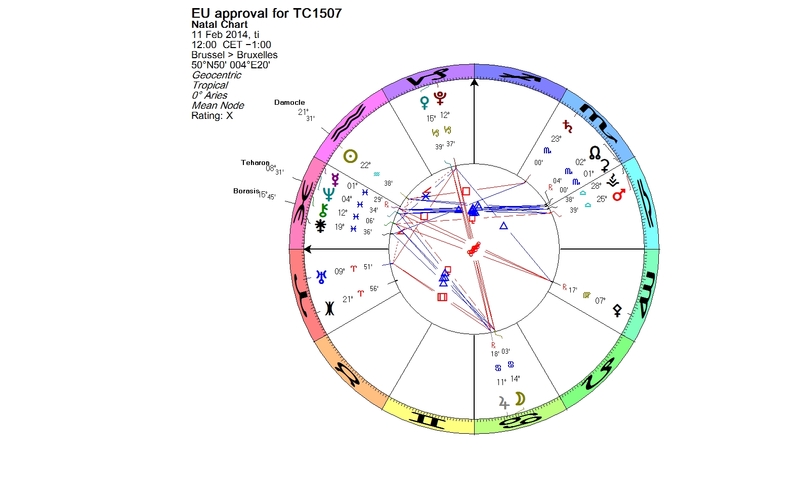 The astrologers are watching the Grand cross developing, formed by Mars, Jupiter, Uranus and Pluto, and at the same time the whole world is watching the crisis in Ukraine deepen. Ukraine proclaimed its independence from the Soviet Union on Aug. 24, 1991. The referendum confirming independence and the first presidential elections took place on Dec. 1, 1991. According to The Book of World Horoscopes by Nicholas Campion, the result was announced at 6:00 pm GMT, and it was then, that Ukraine began to function as a genuinely independent sovereign state. In the chart cast for the time when the result was announced, Uranus is in exact conjunction with the North node of the Moon at 11+ degrees of Capricorn. The lunar nodal axis is currently tightly transited by the t-cross formed by Jupiter, Uranus and Pluto. 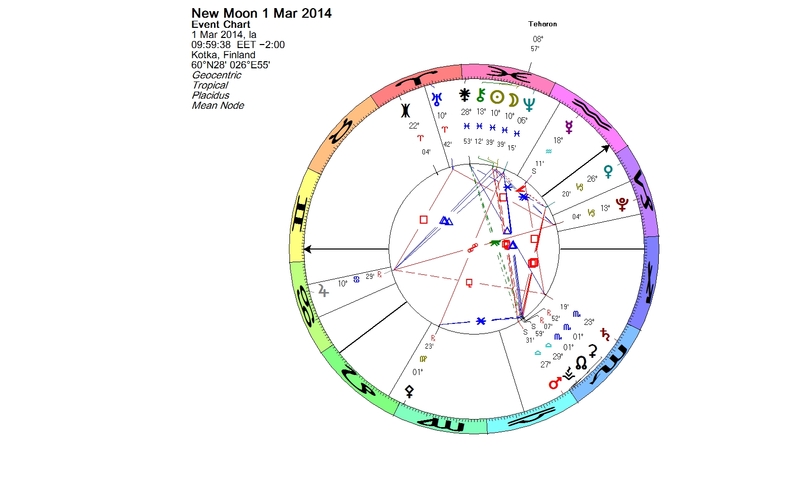 In the chart of the Pisces New Moon, there are two stationary planets, Mars and Mercury. Mercury stationed direct in Aquarius on the previous day, and Mars stationed retrograde in Libra on the same day that the New Moon occurred. A stationary planet is focused and effective. Let’s hope that during the following days these two planets will play well together for Ukraine: Mercury moving in direct motion will support the negotiations, and Mars changing in retrograde motion will ease off the warrior energy of the planet. My main focus in this blog are the new minor planets, such as the Centaurs and the trans-Neptunian objects, and in the chart there are two minor planets prominently situated, both which have a strong association with grain, namely Ceres and Teharonhiawako. The New Moon in Pisces is conjunct Chiron and Teharonhiawako. Teharonhiawako is the maize god of the Iroquois. Ceres, the Roman goddess of the grain, is in exact conjunction with the lunar North node in early Scorpio, and also in conjunction with the stationary Mars in late degrees of Libra. According to Demetra George, Ceres symbolizes the principle of adaptation and the survival of the species, among other things. 88611 Teharonhiawako is a binary trans-Neptunian object. The companion is called Sawiskera. The names come from the Iroquois creation myth. The twin gods are the grandsons of the Sky Woman, who was said to have fallen through a hole in the sky. There are several versions of the creation story, and in one of them the creator god was said to have planted a single maize plant in the body of his mother, the Sky Woman. The plant was a gift to mankind. The twins are personification of good and evil. Teharonhiawako was a farmer and was loved by the people. Sawiskera was the evil twin. He was jealous, cruel and destructive, and he was eventually conquered by his brother. The creation story is reflecting almost literally in the cultivation of maize. Maize has been grown thousands of years. Today it is the most widely grown grain crop throughout the Americas, and widely cultivated throughout the world. Maize constitutes a staple food in many parts of the world. Genetically modified maize represents the evil side of the story. There are potential health risks and serious environmental risks concerning GM food. On Feb. 11, 2014, a new genetically modified corn, insect-resistant TC1507, made by DuPont and Dow Chemical, won EU approval in a controversial voting, even though a majority of the member states were opposing. This is possible because in the EU voting system the votes of the big countries carry more weight than those of the smaller ones. I am sad to tell that Finland, represented by Alexander Stubb, our Minister for Europe and Foreign Trade, voted for the approval. In the chart cast for Feb 11, 2014, the Sun is in conjunction with 5335 Damocles, named after a figure of Greek mythology. “The Sword of Damocles” is an expression, which is used as a metaphor for the imminent and ever-present peril faced by those in positions of power. We should be careful what we ask for, when we are dealing with Damocles. In Pisces we find a stellium of planets pregnant with meaning: the retrograding Mercury is not recommendable for decision-making or signing contracts; Teharonhiawako, the maize god himself, is between the awareness giving Chiron and the blurring Neptune; a few degrees from Chiron there is Borasisi, a minor planet, the meaning of which is related to lies that we believe and that make us feel better. The case is not yet closed. Because of an error in the procedure, the final decision concerning the new GM corn will be made by the European Court of Justice. This entry was posted on Tuesday, March 4th, 2014 at 1:28 am	and is filed under Mercury station, New Moon. You can follow any responses to this entry through the RSS 2.0 feed. You can leave a response, or trackback from your own site.